“I think much more than ‘Cloud Gate,’ ‘Cloud Column’ is meant specifically to capture the heavens and bring them down to earth,” MFAH’s director, Gary Tinterow, told Hyperallergic. The Museum of Fine Arts, Houston (MFAH) unveiled a new outdoor sculpture on Monday, a monumental reflective piece by Anish Kapoor that immediately brings to mind his iconic “Cloud Gate” in Chicago, more widely known as “The Bean.” The sculpture, known as “Cloud Column,” now stands on the newly developed plaza of the museum’s teaching institute, the Glassell School of Art. Never before displayed in public, “Cloud Column” is actually a precursor to “Cloud Gate,” and it stands upright rather than curve over the ground. This pre-Bean resembles less a kidney bean than a snow pea. 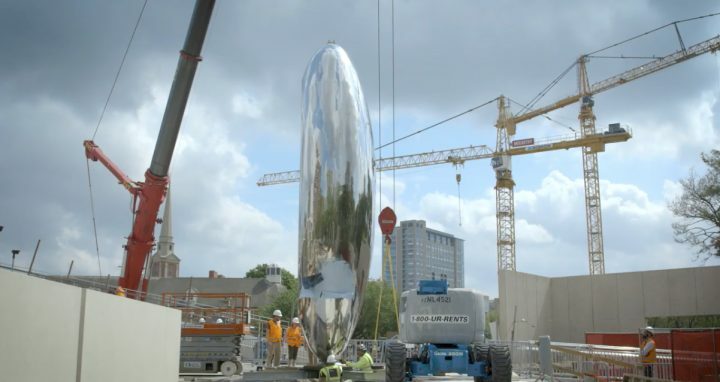 Oblong in shape, it rises 32 feet-tall — just a foot shorter than the Bean — and weighs 21,000 pounds. Like the Bean, “Cloud Column” is made of polished stainless steel to reflect its surroundings, making for an opportune site for selfies. But the two are very different works, largely due to how Kapoor executed each. “Cloud Column,” which was conceived in the late ’90s and realized in 2006, is a hand-fashioned object and has a rougher surface. “Cloud Gate,” designed for a 1999 competition and unveiled in 2004, comprises 168 steel plates created with computers and robotics that were then welded together in Millennium Park to present a smooth armor. 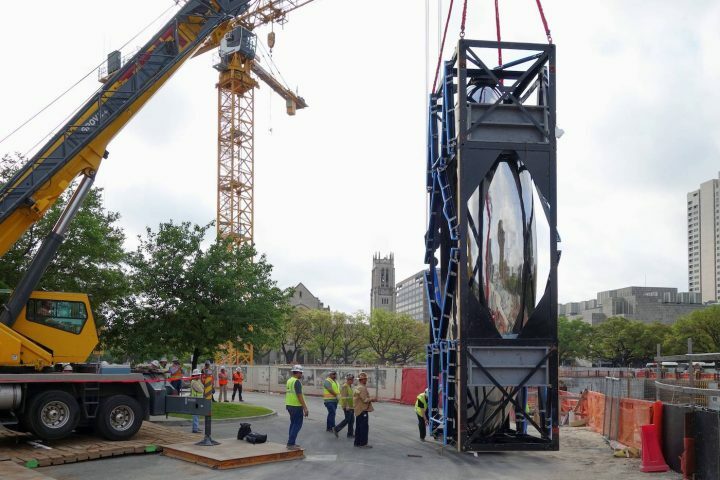 Monday not only marked the end of the sculpture’s two-day-long installation but also the long-awaited completion of a vision that was once put on hold. “Cloud Column” was originally commissioned for the British Museum, but the project fell through. 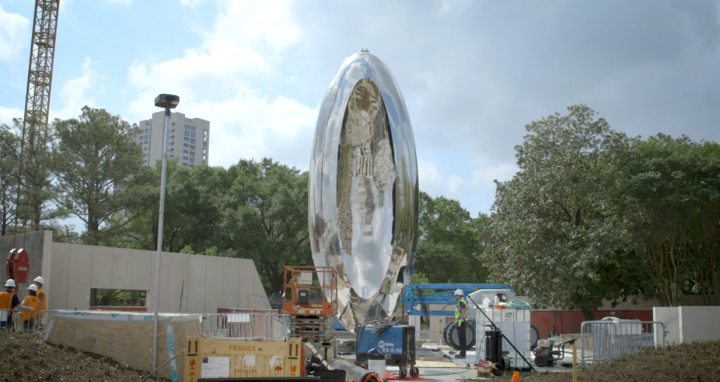 Unfinished, the sculpture resided in Kapoor’s London studio for years, and the artist went on to realize other works including “Cloud Gate.” Kapoor later received funds from benefactors to complete it, and MFAH decided to acquired the sculpture about three years ago. 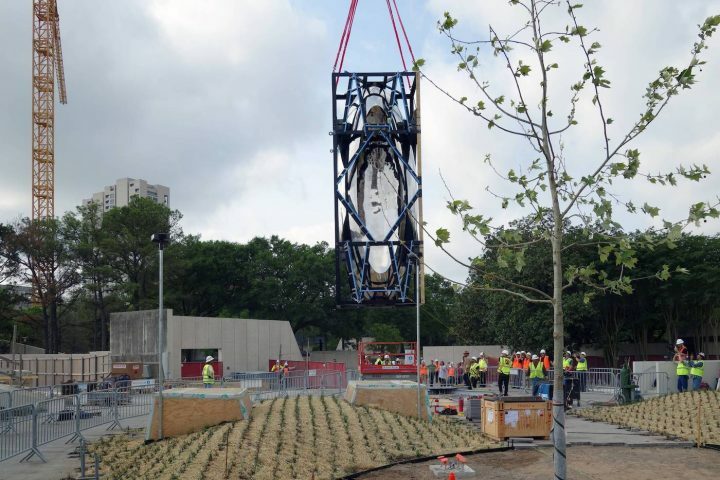 It is one of many sculptures it has acquired as part of its ongoing campus expansion, and will no doubt serve as a distinctive and engaging city marker. 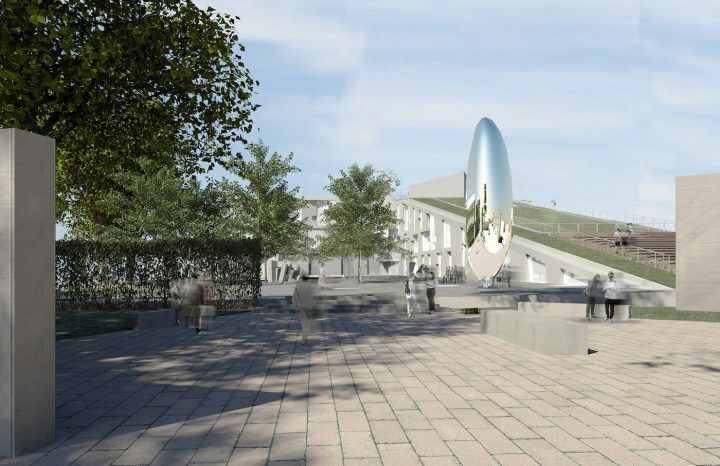 When asked whether any possible nicknames — whether or not derived from “The Bean” — have been proposed already, he said, “I haven’t heard one.” The director also added that he has not yet snapped a selfie, largely due to heavy rainfall. Members of the public will have to wait a little longer to capture their own reflections, as the plaza is still under construction. It is set to open on May 20.